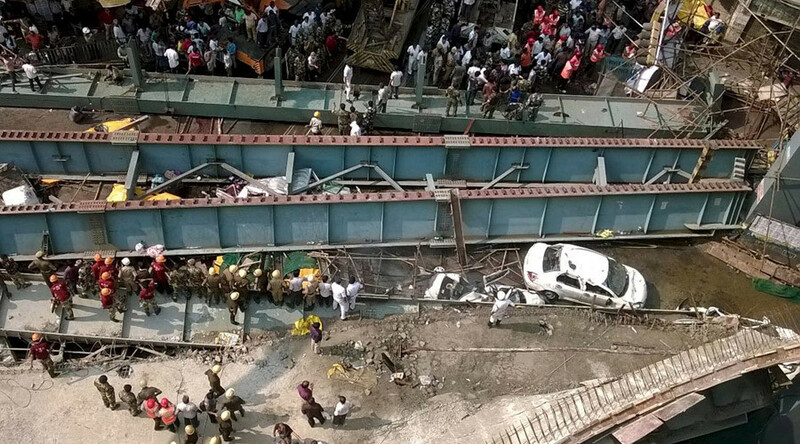 Stomach-churning footage has emerged of the moment an under-construction flyover bridge collapsed, causing utter carnage in the Indian city of Kolkata. The shocking seven-second video taken near Girish Park in the north of the city shows a busy intersection jam-packed with motor-vehicles, rickshaws, street vendors and pedestrians totally oblivious to the major disaster about to befall them. Suddenly, the mammoth structure drops, crashing to the ground as the camera darkens and fills with dust. Particularly striking in the footage is the apparent lack of any last second indicators that the flyover is about to collapse, with nobody in shot looking up or hesitating as they go about their business. At least 10 people have been confirmed dead while up to 150 people are believed to be trapped under the debris. Rescue operations are underway.